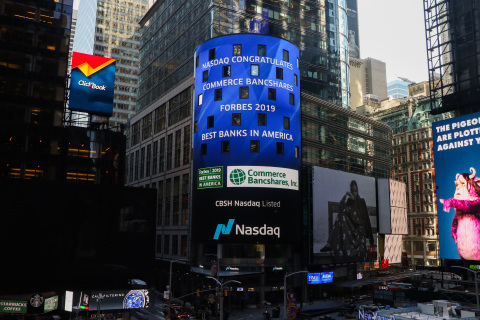 Commerce Bank is the top-ranked Missouri bank on Forbes' America's Best Banks 2019 list — one of the most respected lists in the industry. Overall, Commerce was ranked 17th in the nation. The annual Forbes list, which was created in response to the 2008 financial crisis, enlists S&P Global Market Intelligence for data measuring the growth, credit quality, efficiency and profitability of the country's 100 largest publicly-traded banks and thrifts by assets. Since the list first debuted, Commerce Bank has consistently ranked near the top among the highest-performing institutions. "It is an honor to be considered by Forbes as one of the best banks in America," said John W. Kemper, President and Chief Executive Officer, Commerce Bancshares, Inc. "At Commerce Bank, we hold our ourselves to the highest standards for customer service, employee engagement and community stewardship. This recognition is a reflection of the work of our Commerce Bank team as well as the thousands of loyal customers who entrust us with their financial well-being." With $25.5 billion in assets1, Commerce Bancshares, Inc. (NASDAQ:CBSH) is a registered bank holding company offering a full line of banking services, including payment solutions, investment management and securities brokerage. Commerce Bank, a subsidiary of Commerce Bancshares, Inc., leverages more than 150 years of proven strength and experience to help individuals and businesses solve financial challenges. In addition to offering payment solutions across the U.S., the Company currently operates banking facilities in nine key markets including St. Louis, Kansas City, Springfield, Central Missouri, Central Illinois, Wichita, Tulsa, Oklahoma City and Denver. Commerce Bank also maintains commercial offices in Dallas, Houston, Cincinnati, Nashville, Des Moines, Indianapolis, and Grand Rapids. Commerce delivers high-touch service and sophisticated financial solutions at regional branches, commercial offices, ATMs, online, mobile and through a 24/7 customer service line. Learn more at www.commercebank.com.